I am sitting on the train on my way home from Hillside school in Aberdour in Fife. I’ll probably not get this online until tomorrow. I have just spent the day on David Noble’s course on Using the Social Web to develop the Four Capacities. Aberdour is a pretty looking village and we had a nice autumnal view when we took a minute to look out the window. David took participants through a gament of Web 2.0 tools explained there use in theory and in practise; participants created an edublogs blog, a mp3 recording (which was uploaded to the blog), took part in a flash meeting, explored flickr, youtube and discussed many other web tools in a packed day. As in listening to David’s booruch podcast you get the feeling you are in the safe hands of someone who not only has a leading edge grasp of the new technology, but can walk the talk, incorporating the tools in his teaching regularly over an extended period of time. He explained the tools, suggested ways of using them, pointed to good practice and reinforced them with his own practice. I was comforted by his reference to aCfE and the four capacities, it looks like some of our efforts to use the social web will support the aims of aCfE. I was particularly interested in the use of Flash Meeting. David had organised a meeting with Lisa from England and it was the first time I had seen Flash Meeting used. Flash meeting is a free to education tool supported by the Open University. A browser based video conferencing application, whch includes a shared whiteboard and chat, it reminded me of Marratech which I’ve used in the Glow trials. Flash Meeting seemed to have the edge over Marratech o the video quality and in the fact that it is a flash/browser based application. I hope to be able to use it in school, just need to check to see what protocols it uses and if these are usable on the Glasgow network. I also enjoyed David’s presentation, instead of powerpoint, David used a series of del.icio.us pages for each segment of the day: tagged with “3Nov1” on del.icio.us through to tagged with “3Nov7” on del.icio.us, this method of presentation was obviously very flexible due to a pile of excellent links. Throughout the day David touch on pupils safety issues in a light way but constantly reminding us of its importance. He is in the unusual position of having services often filtered in Local Authority networks available and has to deal with the risks in a professional manner. This also meant that I could plug my laptop in and be online without any problem. Hillside School is a residential school for boys aged 11-16 with social, emotional and behavioural difficulties David’s experience made a clear link in my mind between pupil motivation and the four capacities. David’s work shows that Social media will help us both motivate pupils and to help them move towards becoming successful learners, confident individuals, responsible citizens and effective contributors. I run a couple of after school clubs at Sandaig, today was the primary 7 computer club. The number are limited to 12 so that we don’t have to worry about resources and help. I usually have a lovely time. The primary sevens are working on Scratch. After one of the children’s nice flash movies produced last session I was tempted to stick with Flash, but Scratch is getting a lot of coverage so I though I’d try it. We started exploring the scratch files on the projects page and watching one of the Scratch Videos. The next week the children worked through the Getting Started pdf. We missed the week after as I was at the Scottish Learning Festival and this week the children started on the Scratch cards. They are beginning to get comfortable with the interface and are having a ton of fun. It is lovely watching them find things out for themselves, some quickly found the record sound facility and gales of laughter echoed round the school. Some children quickly wanted to leave the introductory cards and explore ideas for themselves. Quite often these ideas seem pretty advanced and are leading up blind avenues but usually making interesting discoveries along the way. The children worked in pairs and sometimes one group has a solution the others need. I’ve not really explored scratch at all by myself, the children know this which hopefully will give them s sense of pride. I do have enough basic programming concepts to be able to give some help. I a not sure if the children will be able to progress to the levels of some Scratchers (see for example munkeeb’s Stuff) in the time available, but I am sure they will have fun. I wonder how they would get on if they had an hour or two a day working with this stuff for a couple of weeks, could that work with the curriculum for excellence? On Thursday I went over for a holiday visit to Lourdes Secondary School to visit Lori Ramsay. At the last Glasgow Masterclass meeting Lori had presented a tantalising view of The Mothership which seemed to involve enterprise, podcasting and music. Wendy from Edict invited me to get in touch with Lori to find out more and I popped over to the southside of the city on Thursday morning. Lori met me and took me to a music classroom full of macs, keyboards and other musical gear. She booted up one of the few macs in Glasgow City Schools and launched into a garageband lesson! This was great, I’ve steered clear of GarageBand except for the occasional voice and background podcast as I have the musical ear of a turnip. Lori quickly showed me how to teach children to put together a short song or jingle, first blocking out drums, then rhythm and synth followed by some instruments, until we had a wall of sound ‘blocks’. She then knocked holes in the wall to create an intro, verse and chorus. This would be broken down into several lessons in class, but you could really see how excited the children would be. Lori gave me quite a few bit of essential information that a musical person would understand and that I can follow. I an now ready to teach some music watch out for the effect on Radio Sandaig! Lori explained that she was not a teacher, although she teaches sound engineering at Lourdes, she has a professional sound engineering background. She brings the real world into the classroom using the enterprise model. 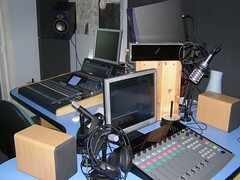 The pupils learn radio production and sound recording skills at SQA Int 2 Higher and Advanced Higher levels. I m sure that the string of backstage passes hanging on the wall and working with an expert from the real world wil ladd to the positive effect of working on a ‘real’ task. Next Lori took me through a well equipped music studio to a soundproof room where the music could be edited and Radio Shows created. We listen to some of the children’s work. It was immediately apparent that the sound quality was much better than you usually find in a school podcast. We listened to professional sounding music, intros and voiceovers the pupils organising and running the shows. Some of the music was produced by the pupils and some by independent musicians. I was surprised to find that the children produce not podcasts but streaming audio. This is wrapped up in copyright issues, the station plays music from up and coming bands. I asked how they got the music expecting that they would be pulling it from music sharing sites, Lori pointer to a huge pile of CDs these were sent in by aspiring bands to play on the show. Lori told me the pupils organised a event at the Garage night-club in Glasgow. The show included signed and unsigned bands including some musicians from the school. A & R folk from major record companies turned up. Undoubtedly this has had a real effect on the pupils involved, Lori mentions the positive effect on their attitude and that they are learning real world skills as they gain academic success. The program has a neat fit with the Curriculum for Excellence as well as enterprise. Next we went online to take a look at the The Mothership. Plans are afoot to expand the number of schools involved. As well as the music section of the site there is a password protected, secure section as well. This allows pupils to log on and download learning resources or take quizzes on the site. There are also chat rooms which are opened by teachers to help with homework and pre-exam revision. The site is still under development but plans are that pupils will have alien style avatars which they will be able to customise as the gain points through completing learning activities. Lori explained that the design of the site was reviewed by the pupils whose feedback has enabled the web designers to produce what the pupils wanted. Overall the Mothership project is very impressive, hitting academic, enterprise and Curriculum for Excellence targets. I am looking to taking Sandaig’s broadcasting, audio and video, to a more formal enterprise model this session and hope to get on board.